I've taken a couple of days before writing down my thoughts on this week's 'A Play, A Pie & A Pint' at Oran Mor. I'd loved David Ireland's "What the Animals Say" earlier this year so I have to admit my expectations were probably unfairly high for "Arguments for Terrorism". But on reflection, I don't think my expectations were the problem here - it just wasn't very good. There is a great concept in the piece – what must it be like to be one of the world’s most powerful men one day, and by comparison a nobody the next? Will you indulge a Gollum-like impulse to hang on to it? Or step quietly into the background? 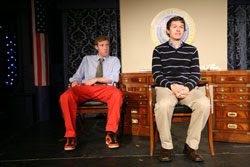 The play gives us parodies of George W Bush in his last days in the Oval Office accompanied by his ‘close friend’ Tony Blair whose relationship is a little more explicit than their official biographies currently reveal. Unfortunately any worthwhile consideration of the men or the issue gets immediately swamped by tired caricatures and laughs bought cheaply with profanity. It feels like watching the first production of a student drama group overindulging their new found license to swear and say rude things. George is stupid, Tony is civilised, George likes a drink, Tony has a thing for Presidents. Yawn. Don’t get me wrong, there are some genuinely funny lines in here – just nowhere near enough of them. This is a one joke show stretched way beyond its capacity to amuse. On my way into Oran Mor I assisted a lost looking couple on the stairs who hadn’t been before and ended up sitting near to them. At the end, I was sorely tempted to tap them on the shoulder and tell them that it really is usually better than this.